Lance Grande, PhD, Curator of Fossil Fishes: Fossil fish, stingrays, turtles, and plants from the Green River Fm. of USA as well as fossil fish specimens from Europe and China. Many of the Green River Fm. 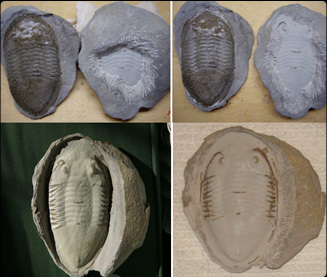 fossils are featured in Dr. Grande’s book The Lost World of Fossil Lake. Olivier Rieppel, PhD, Curator of Evolutionary Biology: Plesiosaur specimens from the Triassic of Wyoming, USA. John Bolt, PhD, Curator of Fossil Amphibians and Reptiles: Fossil amphibians from the Carboniferous of Delta Iowa, USA. John Flynn, PhD, Curator of Fossil Mammals: Fossil mammals from the Cenozoic of the Chilean Andes, South America. SUE: Robert was a member of the team that prepared the Tyrannosaurus rex skeleton known as "SUE" from 1997 to 2000. You can read on overview of the process (and see photos of Robert in action!) on the Field’s “Preparing Sue” web page. Paul Sereno, PhD, Professor of Organismal Biology and Anatomy: Theropod and sauropod dinosaurs, fossil crocodiles, pterosaurs, fossil birds, multituberculate mammals from worldwide localities. Prepared many hominid skeletons from Niger, Africa. Neil Shubin, PhD, Professor of Organismal Biology and Anatomy: The skull of Tiktaalik roseae, an extinct sarcopterygian from the late Devonian sediments of Ellesmere Island, Northern Canada. Tiktaalik is the subject of Dr. Shubin’s best-selling book Your Inner Fish. Michael Coates, PhD, Professor of Organismal Biology and Anatomy: Numerous fossil fish specimens for PhD student research projects. Zhe-Xi Luo, PhD, Professor of Organismal Biology and Anatomy: Robert was part of a research team that visited The Beijing Museum of Natural History, Beijing, China. While there he did detailed preparation on Mesozoic Mammals specimens found in China, and made latex peels and epoxy casts of these specimens for continued research.